STRASBOURG (Reuters) - French President Emmanuel Macron urged Europeans on Tuesday to halt a retreat into national antagonisms and rebuild the European Union as a bulwark for liberal democracy against a disorderly and dangerous world. Addressing the European Parliament, he won applause from lawmakers after condemning the rise of "illiberal democracies" even within the EU and portraying a "Europe that protects" people. Dozens of nationalist MEPs sat in silence, however. Macron noted he was too young to have known the wars that preceded the EU but his family and northern French home region had seen "every blood letting". Echoing the language of historians about Europe's slide into war a century ago, he said he would not belong to another "generation of sleepwalkers" and let the EU wither in what he called an atmosphere of "civil war". Selfish nationalism was gaining ground, Macron warned. But it was a "game of fools" to halt or reverse sharing sovereignty among EU states in the face of challenges ranging from climate change and mass migration to the growing power of multinational corporations and authoritarian states -- a reference to China and Russia, among others. Europe's ally the United States was, he lamented, also being "tempted by unilateralism". "We need a sovereignty that is stronger than just our own, which complements but does not replace it," Macron said in Strasbourg, a French frontier city which has become a symbol of Franco-German reconciliation after centuries as a prize of war. The pro-EU rhetoric of his first year in office has stirred enthusiasm from some. "The real France is back," declared Jean-Claude Juncker, the EU chief executive, after Macron spoke. But the French leader faces a struggle to persuade German Chancellor Angela Merkel, and especially her more conservative supporters, to throw their weight behind grand European designs from Paris. Macron tackled critics among his National Front opponents at home and European leaders such as newly re-elected Hungarian Prime Minister Viktor Orban, rejecting visions of illiberal democracy, hostile to immigration and intolerant of criticism. "In the face of authoritarianism, the response is not authoritarian democracy but the authority of democracy," Macron said. He went on to describe nationalism as a dead end. "We must hear the anger of Europe's peoples today," he said. "They need a new project. Those who trade on that anger are risking nationalisms tearing Europe apart." Far-right lawmaker Florian Philippot, a former National Front member, accused Macron of humiliating France's historic statehood by playing to an audience of unrepresentative European elites. Left-wingers criticised the president for supporting free markets, including labour reforms which have triggered a weekly round of paralysing rail strikes in France. 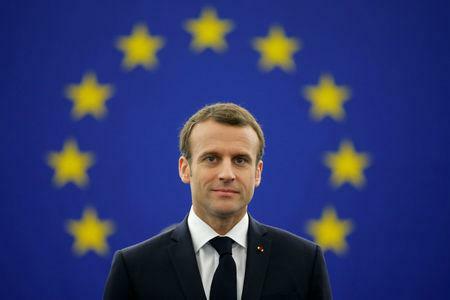 Calling for fellow EU leaders to follow his example in holding a public dialogue on Europe's future, Macron noted that he was launching the process later that day in eastern France. With a little over a year until elections to the European Parliament, he lamented the fact that fewer than half of EU citizens bothered to turn out for previous such votes. He volunteered that France was ready to pay more into the EU budget currently being negotiated as Britain leaves -- on condition that the Union reforms in ways that France wants. Macron ran through his wish list for deeper EU integration as Britain prepares to leave next March. This included new taxation of digital businesses, more support for refugees, closer cooperation in defence and a stronger common approach to running the EU's single currency. Macron was speaking at the invitation of the European Parliament, which has asked leaders of all the member states to give their views on the EU's future following Brexit. Responding to a call from a British lawmaker to maintain close ties, Macron took a dig at Brexit, saying that the best way to have close relations with the EU was to be a member.